Construction worker Carle Rutledge has won Harrolds Fashion Chute Final at Randwick Racecourse. A construction worker has been crowned the most fashionable lady at day one of The Championships at the Royal Randwick. Melbourne’s Carle Rutledge, who works in the less than glamorous construction field, was chosen as the winner of the hotly contested Harrolds Fashion Chute on Saturday. In a field of structured, traditional Derby Day black and white Ms Rutledge’s customised vintage lace dress, adorned with an oversized black bow and paired with spiky Louboutins and a Claire Hahn headpiece stole the show. Yet she hadn’t thought she stood a chance. “I can’t believe it to be honest,” she told AAP. The look impressed the queen of Australian racing millinery Viktoria Novak who was part of a panel of judges charged with choosing a favourite from the field. “As soon as we saw her she stood out for the right reasons because she was unique and different,” Ms Novak said. The master milliner took her hat – or velvet headpiece to be more accurate – off to the impeccably attired contestants fighting it out on the day. Novak knows what it takes to even enter the competition, revealing that it wasn’t that long ago that she had stood on the opposite side of the judging table. 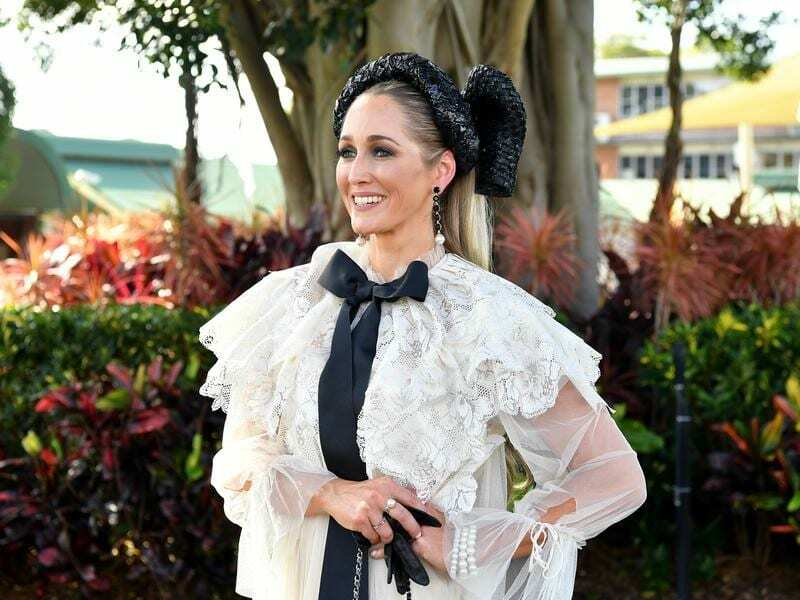 “It’s funny, about 12 years ago I used to enter fashions on the field and I made my own outfit and I remember even being up the night before and sewing the last little pearl on there,” she told AAP on Saturday. Looking sharp on race day was loved up Married At First Sight couple Jules Robinson and Cam Merchant, with the latter sharing her own best tip when it comes to racing fashion. A member of Royal Ascot there’s no doubt Ms Robinson is well acquainted with the do’s and don’t’s of racing fashions – but her best tip? The best accessory is always a winning bet. “I love winning,” she laughed.